Alexandria has finally become immortal and embraced her Nephilim side. This book follows Alexandria and the immortals/Nephilim as they race to find and destroy the Fallen Angel, Rangor. Alexandria must learn to control the gifts the Lord gave her. She has decided to live fully as an immortal, giving up the job and life she was building for herself in New York. Alexandria and the other immortals travel to New York to pack up her apartment and investigate a book store they suspect is run by the fallen. They’ve discovered that the fallen are running three bookstores in New York, London, and Scotland. The immortals rush to each bookstore hoping to take Rangor unawares. However, Rangor has other plans and forces Alexandria to face him in the same church that Arianna perished in. Ultimately, the choice is Rangor’s, to either accept the light the Lord is offering or to perish forever. Alexandria has also decided who she will give her heart to in marriage. ***spoiler alert*** She has decided to marry Gaius and continue the life they once had. They plan to marry immediately after Rangor is destroyed. 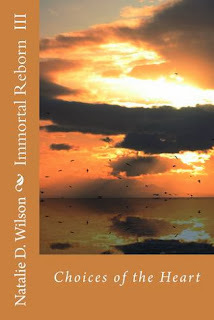 I enjoyed this book of the Immortal Reborn series more than book two. It was much less repetitive. I loved the relationship Alexandria and Gaius shared and the loyalty they felt for each other. I enjoyed the interaction between Alexandria and immortals she hadn’t had the opportunity to meet in the previous books. I admired the strength Alexandria showed when fighting the fallen. I was sad that Kronis died to save Alexandria, but I was glad he embraced the light and was no longer suffering. I would love to read more about the characters in this series. It would be fun to follow Jack, Iain, Sabina , and the other Nephilim’s lives to learn more about them and where their lives lead them.